Some photos taken at the celebration that took place on the 21st April 2018 at the Friends Meeting House in Manchester. 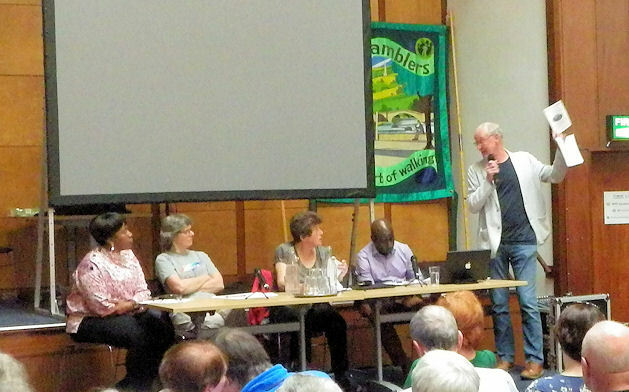 Some of the guest speakers, from left to right: Yvonne Witter (Peak District Mosaic), Kate Ashbrook (Ramblers Chair), Margaret Manning (Manchester Area Chair), Maxwell Ayamba (Projects Manager for Sheffield Environmental Movement) and, standing, David Toft (Poet and Vice-Chair of Hayfield Parish Council). The other invited speakers were Jim Perrin (Rock Climber and Travel Writer) and Keith Warrender (Local Historian and Writer). 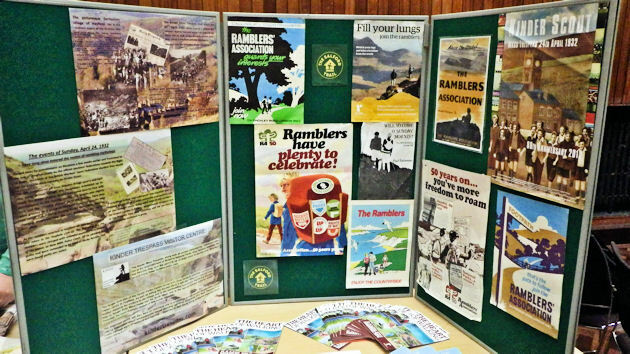 Attendees enjoyed informative displays at the back of the hall provided by the Ramblers, the National Trust, Peak District National Park, Sheffield Environmental Movement (SEM), Peak District Mosaic and the British Mountaineering Council (BMC). The Ramblers' stand showed a selection of historical posters and information about the Trespass. 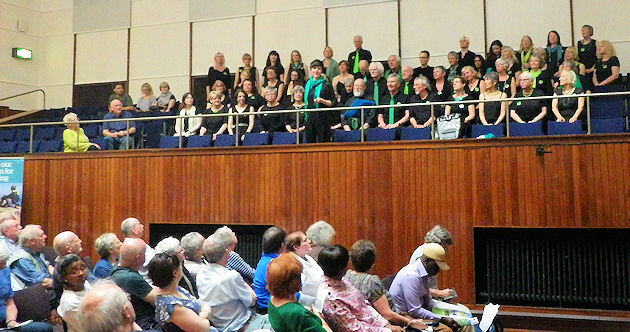 The Manchester Community Choir (Musical Director: Liz Powers) gave a wonderful performanace of songs which reflected the struggles of working people. The day culminated with a rousing community rendition of The Manchester Rambler led by local folk singer Jack Parker.